In order to meet pressing manning needs in the UK National Defence Headquarters (NDHQ) sought to identify opportunities to relieve fit troops, serving in Canada, with soldiers who did not meet the standards for overseas service. One solution was to raise battalions of soldiers who, due to age, fitness or other reason, were limited to Canadian domestic duties. These battalions would then be assigned guard duties at strategic points that had been identified as potential targets for sabotage by a ‘fifth column’. Two such units were the No.1 and No.2 Special Service Infantry Battalions, the establishment of both being effective from 15 June 1942. 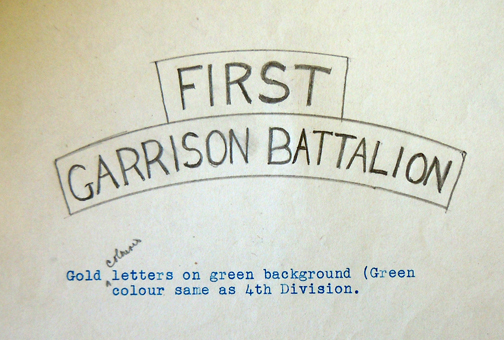 Within days these two units were redesignated 1st and 2nd Garrison Battalions, again to be effective 15 June 1942. [i] The duties of the 1st Battalion consisted of guarding the locks and power plants in the Thousand Islands area of Kingston, taking over this function from active army regiments who then proceeded to England. It is believed that the 2nd Canadian Garrison Battalion was located at Barriefield, near Kingston and carried out similar duties. On 3 September 1942, the two battalions were allocated to the Canadian Infantry Corps. 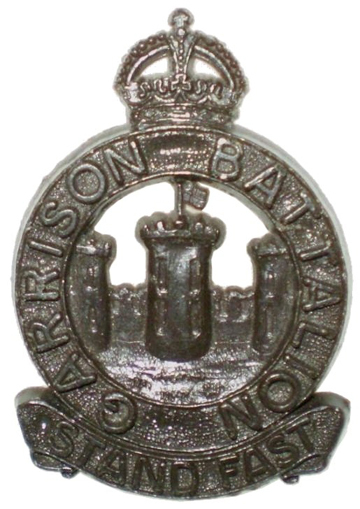 This change in allocation may have been the catalyst for the Commanding Officer of 1st Garrison Battalion to seek unit insignia for his unit as, on the 22nd of that month, Lt-Col G. Carmichael wrote to Headquarters, Military District No.4, at Montreal, submitting a design for a cap badge. [ii] This included the comment that “badges of our own would have a great effect on morale and help in creating a Regimental “Esprit de Corps”. Initial drawing for the 1st battalion badge. A pencil notation asked “where is the Union Jack on staff?” Although Lt-Col Carmichael commands the ‘1st’ Garrison Battalion he has incorrectly used the naming convention ‘No.1’. Dimensions – width one and nine sixteenth inches, height two and three eights, Scroll one and nine sixteenths inches by one and a quarter inches. Size of all letters three sixteenth of an inch. These are shown on the sketch. Castle design to be white metal and remainder bronze. The area between top and bottom of castle and the enclosing circle to be blank. In case of Officers badges the castle is to be silver. The letter was acknowledged with the caveats that it was not policy to provide badges for battalions as theses were “provided on a regimental basis only”, and that the metal situation was such that early delivery could not be expected. On 12 October (incredibly quick considering military bureaucracy) a written consultation was distributed between the Master-General of the Ordnance (MGO), the Adjutant-General (AG) and the Chief of the General Staff (CGS). This document asks whether a badge should be allowed on a battalion basis, identified the challenges of having these made in plastic at a time when the army was considering have all badges made of plastic and the need to have new dies made, and if it was desirable to be able to distinguish between members of the battalions. Hand-written comments by these officers suggest that the preference was for a single cap badge (i.e., on a regimental basis) with individual battalions identified by cloth shoulder titles. Drawing of the badge prior to the decision to remove any mention of battalion numbers. 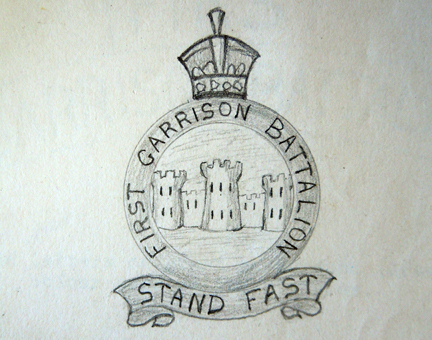 In the meantime, a new drawing of the proposed cap badge was prepared which saw a change to the unit name in the scroll, changing from ‘No.1’ to ‘First’. 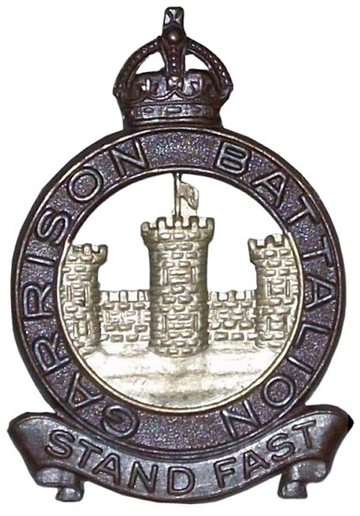 This design was made obsolete almost immediately when, on 27 October, the MGO advised the Commanding Officer, MD2, that “It has been decided that a standard pattern cap badge will be provided for all Garrison Battalions.” By the end of November, Ministerial approval had been obtained for the expenditure of $900.00 to pay for the mold and an initial provision of badges to all Other Ranks of the battalion. An example of a production badge. The thickness of the badge, required to prevent excessive wastage, was disliked by the battalion. The castle in silver, remainder of badge in bronze. 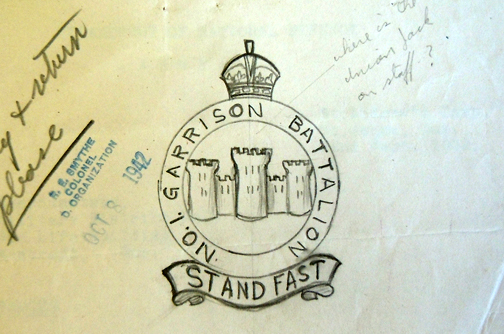 Within an annulus inscribed “GARRISON BATTALION”, ensigned with the Imperial Crown, a castle with three battlemented towers, over the centre one a Union Jack flying from a flag staff: below, a scroll inscribed “STAND FAST”. 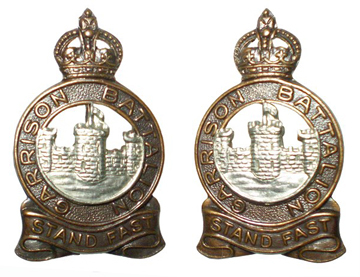 Collar badge – The castle in silver, remainder of badge in bronze. As for cap badge. Extreme width – 1 inch. Other Ranks. Badges of the same design as for Officers, but to be of brown plastic. Examples of an officer’s cap badge and collar badges. “The distinction between Battalions will be maintained by means of the regimental embroidered title worn on the top of the sleeve. The design of shoulder title submitted with your letter dated October 23rd is therefore considered quite satisfactory and provision action will be taken at once.” Following this approval for the title its ensuing production was considerably faster than for the cap badge. First drawing of the cloth shoulder title. The material was identified as Melton No.1 with gold coloured embroidery. 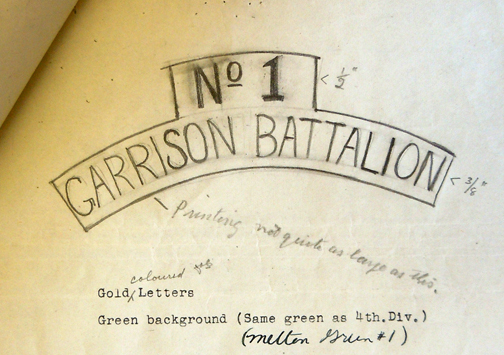 Note that the size of “No.1” was larger than “Garrison Battalion”. Final drawing upon which production was based. The initial drawing used the “No.1” identifier in lieu of the later approved “First”. [iii] This was soon corrected and a new drawing prepared. Once the drawing was approved, the Inspection Board of the United Kingdom and Canada (IB) was tasked with the contracting process. On 17 November 1942, six sample titles, manufactured by S.A. Grant, were forwarded to NDHQ for approval. Once approval of the samples was obtained an order for 4,000 titles was placed and these were shipped to Toronto on 9 January 1943. A contract was let for 4,000 shoulder titles to the First Garrison Battalion and these were delivered in January 1943. At least six samples were made but it is believed that a production contract was let for the Second Garrison Battalion titles. [ii] The 1st Garrison Battalion was at St Andrew’s Camp, St-Jean, Quebec (now St-Jean-sur-Richelieu) undergoing training prior to taking up their duties. [iii] The use of ‘No.1” was incorrect but then so was ‘First’. The unit’s official title was ‘1st’ as shown in all General Orders. Further, if the Canadian Parachute Corps could be used as an example, the 1st Canadian Parachute Battalion used a simple ‘1’ as the battalion identifier on the shoulder title.